Saw this junkyard driveway and wondered. Was it just a cleaning of the house or a moving day? Either way, it didn't take very long for the vultures to sniff it out. 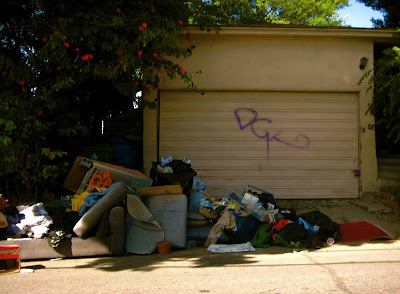 As a couple days later I saw the house again and, yep, a big tag went up and junk was sprawled out even more. No big deal, you just buff it out, stuff some trashcans and stack your heap up a little better. Now, we can all learn from this. Just clean yo crap right. B-52's "Dance This Mess Around"
I hope to hell it is a moving sale!!! 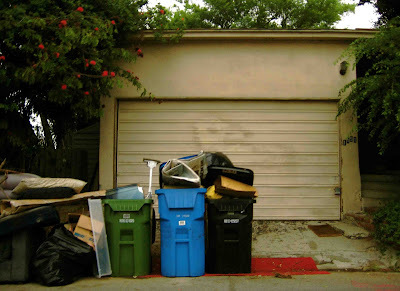 All that junk must have been why they couldn't park any of their five crappy cars in the garage.